A plan to have Ohio taxpayers bail out the state’s two struggling nuclear power plants was a non-starter in the legislature just a few months ago. Now, it’s a high priority. What happened? New state lawmakers, many of whom owe their elections in large part to a powerful backer with a vested interest in fossil fuels and nuclear power. FirstEnergy, the Akron-based utility that long owned the Ohio nuclear plants, spent heavily in Republican legislative primaries. The company and its allies backed the winners in enough races to get its preferred candidates into top positions. FirstEnergy’s aggressive strategy has broad implications for Ohio’s energy future. It has been a leading adversary of policies that support renewable energy and energy efficiency, while at the same time seeking state and federal bailouts for its older nuclear and coal plants. It was among those urging the Trump administration to use emergency powers to provide financial support to uncompetitive fossil fuels plants that otherwise might close. The next few months may now show the extent to which the company’s agenda has become the state of Ohio’s agenda. Legislative leaders are preparing to introduce a bill that would provide subsidies to companies that operate nuclear plants. A previous nuclear bill died in 2017 after it wasn’t brought up for a committee vote in the Republican-controlled House. But the House leadership, while still Republican, has changed. “Those with specific interests have figured out how to game the system and how to maximize their influence,” said Catherine Turcer, executive director of Common Cause Ohio, a group that works for fair elections and government transparency. This push for a nuclear bailout could also present an opportunity for renewable energy in Ohio, a state with a renewable energy manufacturing base but an on again, off again history of support for wind and solar. On their own, nuclear subsidies are politically difficult to get approved. Three other states that passed similar measures—Illinois, New Jersey and New York—all did so as part of wide-ranging energy legislation that also increased support for renewable energy. Pennsylvania, where FirstEnergy is pushing another nuclear subsidy bill, is also considering including subsidies for renewable energy. Can there be a grand bargain with environmental advocates in Ohio? The new House speaker relied on Democrats for his rise to power. If the bill includes some Democratic energy priorities, it may pick up enough votes to pass this time, in spite of FirstEnergy’s previous opposition to most of those priorities. There is an economic case to support renewable energy and energy efficiency in Ohio. The state is a leader in clean energy jobs, thanks in part to its manufacturing roots, and advocates have long argued that this edge in manufacturing could be the foundation for a much larger clean energy economy. But so far, Ohio lawmakers who support clean energy say they haven’t been invited to the table. A political earthquake hit on Jan. 7, when Ohio Rep. Larry Householder was elected House speaker, narrowly defeating the incumbent, fellow Republican Ryan Smith. His election was a surprise for many in the chamber, and the tension was palpable as members cast their votes. Householder is a political veteran who had been Ohio House speaker from 2001 to 2004. He left to focus on several business ventures, but won back his seat in 2016. As the votes appeared on the chamber’s electronic board, it became clear that he had put together a narrow majority with a coalition of Republicans and Democrats. He wooed Democrats with the promise that he would not support anti-union legislation, among other concessions, even though he campaigned as a champion for President Donald Trump’s agenda and had a history of ethics concerns dating back to his prior time as speaker. More recently, he faced questions about having flown on a FirstEnergy corporate jet to attend Trump’s inauguration. At least nine pro-Householder Republicans were winners of contested primaries, and most of them defeated candidates loyal to Smith. FirstEnergy and its allies spent heavily in Republican primary races, and their preferred candidates won most of them. The candidates are easy to spot on campaign finance reports. About a dozen of them received identical $7,707.79 contributions last February from Householder’s campaign committee, which is an unusually high dollar figure for a non-incumbent in an Ohio primary. Seven of those candidates also got large payments from FirstEnergy’s political action committee, ranging from from $5,000 to $13,700. One example was the Republican primary for an open House seat in the district that includes the Perry Nuclear Power Plant, long owned by FirstEnergy. House Republican leaders supported John Plecnik, a law professor and city council member, who raised $166,444 for the campaign. Plecnik’s opponent, lawyer and former House member Jamie Callender, raised $242,240, with big checks from Householder and his allies, including FirstEnergy and donors tied to the coal industry. In mid-February, Householder named Callender chairman of the House Public Utilities Committee, the panel that will play a key role in legislation involving FirstEnergy. FirstEnergy spokeswoman Jennifer Young, responding to questions about campaign contributions, said the company donates to “candidates and officeholders whose interests align with those of our customers, employees and shareholders.” She declined to get into specifics of individual donations. The company’s donations lean Republican, but include some Democrats. Why Is FirstEnergy Pushing a Nuclear Bailout? FirstEnergy and its allies have been prolific donors across state government, but that wasn’t enough to pass the nuclear bill over the last two years. “The Ohio House is interested in creating an environment for the future that encourages investment in lowering CO2 emissions in Ohio generation,” he said, adding that “we want to ensure that Ohio continues its proud heritage of leading the Midwest in energy production.” He did not answer questions about his campaign spending. If a nuclear plan passes the House, it will still need to get through the Republican-controlled Senate and be signed by new Republican Gov. Mike DeWine. Asked about the potential for nuclear plant subsidies, DeWine told reporters last month, “We’re working on that” but gave no timetable. “If we lose those two nuclear plants, they comprise the vast, vast majority of the clean energy that we have today in the state of Ohio,” he said. DeWine, who has not laid out an agenda for renewable energy, has also received substantial support from FirstEnergy over his long political career. FirstEnergy was in financial turmoil when it made its campaign contributions. It was in the process of spinning off a subsidiary that owns and operates most of the company’s power plants. That subsidiary, FirstEnergy Solutions, then filed for bankruptcy, with assets that include the two nuclear plants. Nuclear plant subsidies would help FirstEnergy Solutions, though the company’s plan to emerge from bankruptcy this fall does not assume aid from the state. FirstEnergy CEO Charles Jones sent a letter to Ohio lawmakers in February, saying that “sustaining Ohio’s nuclear plants is vital to consumers, communities and the environment.” He said his company, which has utilities serving 6 million customers in the Midwest and Mid-Atlantic, no longer has a financial interest in the nuclear plants but continues to support nuclear aid simply because it would be good for Ohio. Clean energy advocates say this explanation is an oversimplification of complex financial issues, some of which are being hashed out in bankruptcy court and by federal regulators. They also want to know if coal interests will get some kind of aid in the upcoming legislation, in addition to nuclear. Companies and people tied to the coal industry were a key part of Householder’s donor base. What Do Renewable Energy Supporters Want? Nuclear power has a checkered history in Ohio, especially FirstEnergy Solutions’ Davis-Besse plant, which has a history of safety issues, including the 2002 discovery of a football-size void in the reactor head casing caused by corrosion and a 2006 legal settlement after employees were caught filing false safety reports. 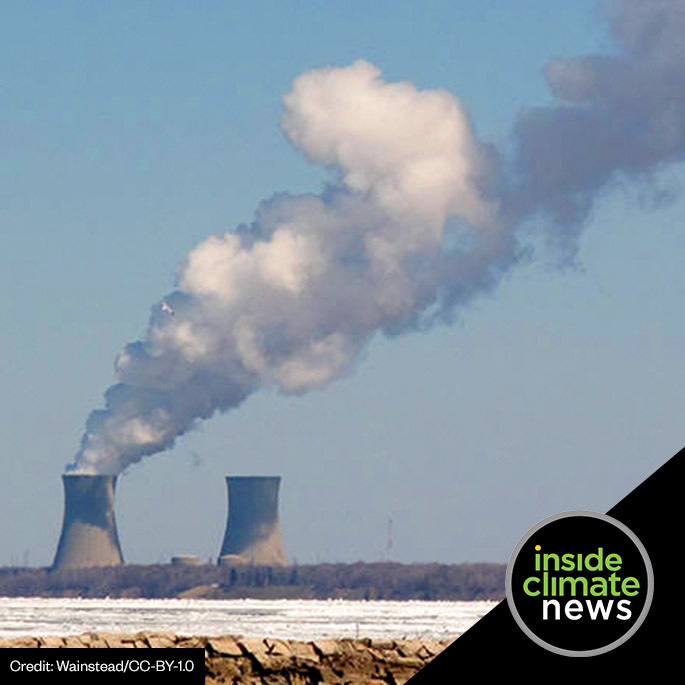 Some environmental advocates have begun to warm up to nuclear as a source of carbon-free power while the energy market moves away from fossil fuels, an argument the Union of Concerned Scientists set out in a November report. But the group also argued in a December blog post that the Ohio proposal should be rejected because of the safety issues and because the subsidies were not part of a larger clean-energy strategy. Ohio renewable energy advocates have some significant items on their wish list for any compromise agreement. At the top is a repeal of 2014 restrictions on wind farms. The law has the effect of limiting how many turbines can be placed in a project area, which has slowed development. “We don’t like bailing out nuclear plants, but we don’t rule out supporting a package if the package on balance is a good one for consumers and the environment,” said Rob Kelter, a senior attorney for the Environmental Law and Policy Center. Rep. David Leland, a Columbus Democrat, says he and some of his fellow Democrats are open to discussing a larger energy bill that would include support for renewable energy, but that they would need much more than a token provision or two.